With apologies to the Sisters' boys soccer team, golfer Jesse Heinly, the Ridgeview girls' softball team, Oregon State volleyball players Rachel Buehner and Hannah Troutman, locally-bred tennis players Paxton Deuel and Adam Krull, the local pickle ball craze, the coming curling bubble, the Summit High baseball team, Idaho ski resort buyers Matt and Diane McFerran, and, I suspect, countless other deserving nominees, in no particular order, here's one observer's Top 10 sports stories for Central Oregon for 2015. 1 Summit football wins 5A state championship. Just five years removed from two consecutive winless seasons, the Storm put together a season to remember. 12-1 overall record, 4-0 for first Intermountain Conference title, 604 points scored (46 PPG), 142 points against (11 PPG), stars on both sides of the ball--is this the best prep football team in Central Oregon history? 2 Pole, Pedal Paddle replaces the Nordic ski stage with a 2.34 Mount Bachelor trail run due to an absence of snow, which helps professional trail runner Morgan Arritola capture the women's portion and professional triathlete Jesse Thomas—who had never cross-country skied in his life—win the men's side of the annual multi-sport event. 3Bend Elks win first West Coast League title. New ownership, new general manager, new head coach, new players, first championship. John and Tami Marick, Casey Powell, Trey Watt, and a host of talented collegiate players bonded off and on the field to set seven league offensive records, earn the best record in team history and deliver the franchise's first-ever West Coast League title. 4Ashton Eaton Central Oregon's favorite son and, arguably, Mountain View High School's most famous alum, wins the world decathlon championships in Beijing, China, extending his world record in the event to 9,045 points. And, oh, his prep alma mater dedicated and named its track for Eaton in May, which the University of Oregon grad embraced with his customary and refreshing humility and grace. 5 Madison Odiorne The Summit High graduate won an unprecedented fourth consecutive Class 5A state high school golf title, setting a 36-hole scoring record with a 4-under-par 140, shattering her own previous standard by 10 strokes. The now-Washington State golfer was named the National High School Coaches Association senior athlete of the year in girls' golf and earned second in the Oregon Women's Amateur Championship in June. In her first collegiate tournament in September, she finished ninth. 6 Matthew Maton Becoming only the sixth American high school runner to complete a sub-four minute mile, the former Summit High standout runs 3:59.38 at the Oregon Twilight Meet in Eugene in May. Maton's time, which was achieved when he ran just under 58 seconds for the final lap, ranks third behind Alan Webb (3:53.43, 2001) and Jim Ryun (3:55.3, 1965) on the all-time U.S. high school list. 7 Ridgeview defeats Mountain View in boys' basketball for the first time in nine tries. Sometimes, the way you achieve something is even more memorable than the achievement. Tied with 0.5 seconds left in the game, the Ravens' George Mendenzona—who was not the first option on the play—accepts the inbounds pass in front on his cheer section and tosses a 30-foot prayer that is answered with nothing but net to send the home crowd deliriously spilling on to the court in one of the most thrilling finishes in local prep history. 8 Olivia Armstrong Despite arriving in Belgium without her bikes, the Bend High sophomore surprises even herself, winning the 16-and-under women's cruiser category at the BMX World Championships. She also finishes third in the 20-inch girls U15 division. 9 No snow Hoodoo opens for only two weeks in January due to an unseasonably dry winter. The snow sports portion of the Special Olympics Oregon Winter Games, scheduled at Mt. Bachelor, is canceled due to unseasonable rain rather than snow in March. The Pole, Pedal, Paddle nixes the Nordic portion of the race and Mount Bachelor closes on the earliest date in 40 years. But that did not stop local athletes from success on the snow. Emily Hyde won the U20 National Championship Skate Sprint Race and Sam Biskup earned gold in the Sprint race in the male division at the 2015 XC Junior Nationals in March. 10 Summit girls' soccer wins state title. The numbers are mind-numbing. 17-0-1 record. Outscored opponents 88-3. Outscored opponents in playoffs 22-3. Won championship, 7-0, the biggest margin of victory in a state title soccer game since 1997. Four consecutive state titles and five of the last six. 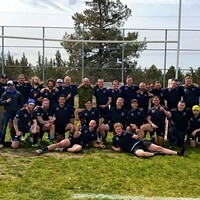 Mike Ficher is the play-by-play voice for COTV Sports, the public address announcer for the Bend Elks, sometimes co-host of Central Oregon Sports Talk on 88.9 KPOV, a Bend North Little League baseball umpire, and a USSF soccer official.